​A heartfelt Thank You to all our members who volunteered at our Farmers Feed Families Event at the Coombs Fall Fair August 8th and 9th, 2015. To the Barn builders and painters, fence builders, goat pen designers and decorators. To the babysitters..:)..and goat and duck and chicken feeders. To all the farms and organizations who hosted tables in our 'barnyard', and did such a great job of showing off their outfits. To the floor staff and hosters who welcomed, answered questions, encouraged interested folks and taught. And, finally, to the 'break-down' and clean-up crew. You know who you are...a very large thank you! We are excited to host our new event at the Coombs Fair this year, "Farmers Feed Families"... Our member farms will share with you, the Fair-attending public, all about their farm activities, products and services, visions, belief systems around healthy food production, and more! The title "farmer", and those it describes, is being re-defined, and no longer applies only to those able to own large parcels of land. If you are concerned, interested, curious, or have skills to share, we'd love to connect with you! Excerpt from RBC WebNews Parksville/Qualicum Beach, Article by Brian Wilford. 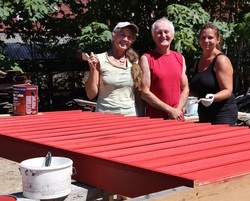 Joining the CFI through the doors of a bright red-and-white barn facade will be master gardener Connie Kuramoto, of Gardens on the Go, as well as representatives from the Qualicum Beach Farmers’ Market; the Salish Sea Culinary Guild; and the Qualicum Beach Community, Education and Wellness Society. They’ll be encouraging people to consider that everyone can be involved in local food, not just farmers, Thony said. Members of the Culinary Guild, for example, host dinners in which 80 per cent of the food is locally produced, she said. They’ll be inviting people to start new chapters of the Guild. Aquaculture producers will also be featured, Thony said. With thanks to the Regional District of Nanaimo's Northern Economic Development Fund for making Farmers' Feed Families possible. Each year, CFI hosts the only remaining auction in mid-Vancouver Island for livestock, poultry and farm equipment. It is known as the "social event of the year" for our local farmers and agricultural enthusiasts! It is also our annual fundraiser that provides monies for two educational scholarships of $1,000.00 each that students can apply for who are pursuing an agriculture-related career. Click here for information on CFI's annual scholarship/bursaries. Pictured right: Glen Hersley, Auctioneer at this year's 37th Annual Farm Auction held at the Coombs Fair Grounds. The last Annual General Meeting (AGM) was held on March 9th, 2015. The next "General Meeting" is 7pm, October 8, 2015 at the Arrowsmith Hall, Coombs Fair Grounds. The next AGM will be held in February 2016.